Goldberg said blacklisting Nielsen would "serve as a warning to others" who've supported President Trump. On Sunday evening, news broke that Kirstjen Nielsen was leaving her job as head of the Department of Homeland Security. The New York Times reporter Maggie Haberman tweeted that according to people close to Nielsen, one reason she hung on as long as she did was because "she was aware how awful life would/will be for her on the outside," given her role in defending Donald Trump's policies. 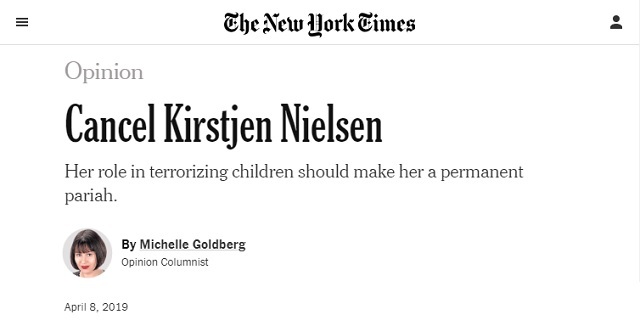 Goldberg, like the rest of the liars in the media, just acts like we don't all know the Obama administration was the one who started "putting kids in cages." What happens to Nielsen now can serve as an example to other people in the administration as they decide whether to just follow orders. By this, I don't mean that people should scream at Nielsen in restaurants. Rather, those horrified by family separation should do whatever they can to deny Nielsen the sort of cushy corporate landing or prestigious academic appointment once customary for ex-administration officials. The fact that she evidently didn't go as far as an erratic and out-of-control Trump wanted is immaterial; she should be a pariah for going as far as she did. Goldberg threw her support behind the SPLC-backed campaign to have "Corporate America" blacklist all former Trump administration officials. Though they bought a full page ad in the Times the day before, it was probably unnecessary. Goldberg ended her piece by calling for "cosmopolitan progressives" to support their "blacklist" effort to "serve as a warning to others" who supported President Trump. Such a boycott would take advantage of one of the central asymmetries in American life. Rural voters, who tend to be conservative, have disproportionate political power; it's why Trump, who lost the popular vote, is president in the first place. But cosmopolitan progressives have disproportionate economic and cultural power, which is why we have the faintly absurd phenomenon of woke capitalism. That power should be deployed to force the sort of accountability Nielsen reportedly fears, and to serve as a warning to others that the Trump stink never washes off. [....]There are plenty of places that will hire a disgraced child-torturer -- private prisons, which often hold undocumented immigrants, are a big business. [...] But as the country hurtles into a dangerous new phase of unbound Trumpism, those who want to say no need to muster whatever leverage they can, including public shame and economic sanctions. Either the leaders of corporate America and academia want to be associated with terrorizing toddlers, or not. The deplatforming and corporate blacklisting is not going to stop with political dissidents on the far-right. The leaders of The Resistance� have made it abundantly clear, as Goldberg just did in her column, that they want everyone who supported Trump in any way to be subject to Soviet-style show trials.